21 Day Online Immersion – Any time anywhere at your own pace. 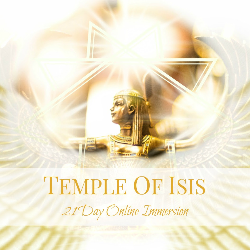 Isis is calling us to come closer to her mysteries and to come closer into connection with her and to strengthening our temple here through more deeply embodying her presence into our sacred lives. Leyolah Antara is a transformational guide, ecstatic dance facilitator and has been a practitioner and teacher of the inner tantras for over 22 years. She is the founder of a cutting edge tantric alchemical ecstatic dance practice called Kundalini Dance, which teaches how to cultivate and utilise sexual creative energy for personal awakening . Her work is deeply transformative and supports practitioners to embrace the spiritual growth opportunities available to them through their sexual relationships. Her work has taken her all over the world to teach retreats and workshops and she has trained over 70 facilitators, in Australia and North America. She has also produced two interactive Chakra Journey CD’s both with instructional booklets, teaching manuals and is the author of Kundalini Dance, A guidebook for Ecstatic Awakening available on Amazon from Feb 2014. He is currently writing her second book, “ Longing For Union” That explores a new paradigm for tantric sexual relationships as an alchemical crucible for transformation and union with the Divine. Leyolah’s methods are on the leading edge, she transmits the ecstatic keys of tantric alchemy through kundalini dance, breath work, womb/hara practices that will connect you to the divine and transform past patterns that have been holding you back from manifesting your hearts desires in your intimate relationships and your life purpose. She is compassionate and caring and has a depth of wisdom that comes from over 22 years of deeply journeying in the arena of tantric shamanic dance and holding space for deep transformation. Leyolah will guide you into the often unchartered area of your shadows and support you to liberate that energy so that you can awaken your power and purpose.